A condition of radicular leg pain, sometimes accompanied by low back pain and may be accompanied by motor or sensory deficit. The initial diagnosis is clinical with the acute or subacute development of low back pain usually with sciatic pain following minimal low back trauma in patients under the age of 50. No x-ray or lab studies are necessary. Over the age of 50, disc abnormalities are possible, but initial lumbar disc syndrome series should be considered which might exclude bony structural abnormalities such as severe degenerative changes, osteoporosis with compression or metastatic involvement. MRI and/or CT scan are not necessary to confirm the initial diagnosis of lumbar disc syndrome except when there is failure to respond to conservative therapy or there is development of neurologic deficit (see Indications for Specialty Care Referral below). The initial objective of management is to reduce lumbar disc syndrome tension. Depending upon the severity, bed-rest or reduction of activity level for one to two weeks is indicated. Analgesics and muscle relaxants are usually helpful. During the acute period, the major consideration is that the sciatic pain is decreasing and overall mobility is increasing. Conservative therapy as described above is indicated. Any limitations that affect strength, range of motion, and general efficiency of the back. 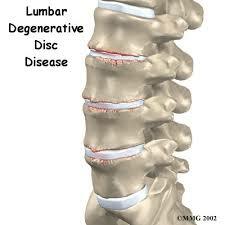 Defects or impairments that require significant restriction of use for lumbar disc syndrome.